Four people were killed in a massacre in Noakhali's Subarnachar Upazila. 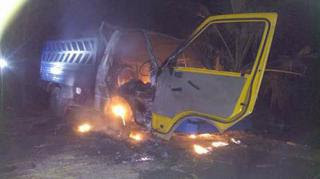 This incident happened in the village of North Kachpia village under Charjubali union on Wednesday midnight on Wednesday. Today, at around noon, the local people arrested and arrested two more suspected suspects from a distance of the area. Police recovered the injured and took them to the police station. Officer-in-Charge of Charbara Police Station, OC of Charbara upazila, confirmed the incident of killing four people in connection with massacre of 'cow slaughter'. Nizam Uddin At around 7:30 in the morning, he said the body of the four dead was recovered. The body was sent to the Noakhali General Hospital morgue for autopsy. The OC said that local people arrested the two people suspected to be from a distance of the area and arrested the suspects. Later, police recovered the injured and took them to the police station. They were treated locally. The names of the casualties are not yet confirmed. According to Nizam Uddin, some people surrounded them from four sides when some people entered the northern Kachpia village of Charzubili with a pickup van around 2:30 in the morning. At the time, when they tried to run away from pickup, local people gave them uproot. Three people were killed on the spot. A local school teacher said that for a few days, cows stolen in various areas of Subarnachar have been increased in view of the Eid-ul-Fitr. Three days before, five cows were stolen from Charjubali and seven cattle from Chirajpur area. Collected thieves came in the dark of night with a pickup van and stole the cow. In view of this, the people in villages have guarded the village. The teacher further said that a pickup van was seen entering the village from Sonapur-Steerghat Road around 2.30pm on Sunday. At that time, the guard guided the others to the incident. They gave barricades by climbing trees on the culvert in front of Jabbar Ali Pandit's shop in North Kachpia village. The pickup van stuck there. It is also known from local sources that when people come from all over, pickup people try to run away. At that time, three of the six people fled. The other three people, agitated by the public, 'suspected of cowboy' Three people died on the spot. Later in the morning, a person who was hiding in a 'dormitory room' in the village, he also died. Later on, some of the more strangers from the area were arrested and suspected of thieving. Later, police rescued them and took them to the police station. Angry people burned that pickup van after vandalism.